Crochet Gauge11 dc + 6 rows = 4 in. (10 cm). Leaving a long yarn tail, ch 8; join with sl st in first ch to form a ring. Rnd 1: Ch 1, work 16 sc in ring; join with sl st in first sc. Rnd 2: Ch 4 (counts as hdc, ch 2), *skip next st, hdc in next st, ch 2; rep from * around; join with sl st in 2nd ch of beg ch—8 ch-2 sp. Rnd 3: *Sc in next ch-2 sp, ch 12, sc in 2nd ch from hook, sc in next ch, dc in next 7 ch, sc in last 2 ch, sl st in same ch-2 sp of Rnd 2; ch 2, turn, skip sl st and next 2 sc, dc in next st, (ch 1, skip next st, dc in next st) 4 times, sc in beg ch; ch 1, turn, sc in first 2 sts, sc in next ch-1 sp, dc in next st, (dc in next ch-1 sp, dc in next st) 3 times, 2 sc in beg ch-2 sp, sc in same ch-2 sp of Rnd 2 (petal made); rep from * around; join with sl st in first sc—8 petals. Fasten off. Rnd 4: Join yarn with sc in point of any petal, ch 7, dtr2tog over 3rd dc from point of current petal and 3rd dc from point of next petal, ch 7, *sc in point of next petal, ch 7, dtr2tog over 3rd dc from point of current petal and 3rd dc from point of next petal, ch 7; rep from * around; join with sl st in first sc—16 ch-7 sp. Rnd 5: Ch 1, sc in same st as join, 7 sc in next ch-7 sp, sc in next dtr2tog, 7 sc in next ch-7 sp, *sc in next sc, 7 sc in next ch-7 sp, sc in next dtr2tog, 7 sc in next ch-7 sp; rep from * around; join with sl st in first sc—128 sc. Rnd 6: Ch 6 (counts as dc, ch 3), dc in same st as join, (ch 1, skip next st, dc in next st) 7 times, ch 1, skip next st, *(dc, ch 3, dc) in next dc, (ch 1, skip next st, dc in next st) 7 times, ch 1, skip next st; rep from * around; join with sl st in 3rd ch of beg ch—72 ch-sp. Rnd 7: Ch 1, sc in same st as join, 3 sc in next ch-3 sp, (sc in next dc, sc in next ch-1 sp) 8 times, *sc in next dc, 3 sc in next ch-3 sp, (sc in next dc, sc in next ch-1 sp) 8 times; rep from * around; join with sl st in first sc. Fasten off. Thread beg tail through sts of first rnd and pull tight to close center opening. ​Sew Medallions together in a long strip to form the Medallion Panel. Row 1: Sc in 2nd ch from hook, *ch 5, sk next 3 ch, sc in next ch; rep from * across—5 ch-5 sp. Rows 2–5: Turn, sl st to 3rd ch of first ch-5 space, ch 1, sc in same ch-5 space, *ch 5, sc in next ch-5 space; rep from * across—1 ch-5 sp. Border Rnd: Work sc evenly spaced around Triangle; join with sl st in first sc. Fasten off. Following diagram, sew Side Triangles to Medallion Panel. Row 1: Work Row 1 of Side Triangle—3 ch-5 sp. Rows 2 and 3: Work Rows 2 and 3 of Side Triangle—1 ch-5 sp. Next (Border) Rnd: Work sc evenly spaced around Triangle; join with sl st in first sc. Fasten off. Following diagram, sew Corner Triangles to corners of Medallion Panel. Row 1: Dc in 4th ch from hook (beg ch counts as first dc) and in each ch across—34 dc. Row 2: Ch 3 (counts as dc), turn, dc in each st across. Rep Row 2 until piece measures same length as Medallion Panel. Fasten off. 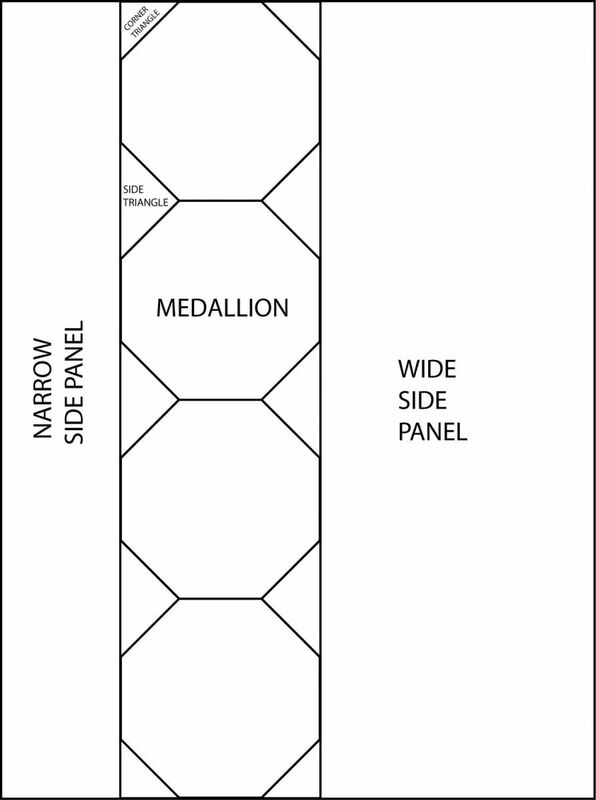 Following diagram, sew Narrow Panel to Medallion Panel. With RS facing, join yarn with sl st in top corner of Medallion Panel. Row 1: Ch 3 (counts as dc), work dc evenly spaced across long edge of Medallion Panel. Rows 3-30: Rep Row 2. Fasten off. With RS facing, join yarn with sc anywhere along edge of Afghan. Rnd 1: Sc evenly spaced around outside edge, working 3 sc in each corner; join with sl st in first sc. Rnd 2: Work reverse sc (sc worked from left to right) in each st around. Fasten off. (Yarn over) 3 times, insert hook in indicated st and draw up a loop, (yarn over and draw through 2 loops on hook) 3 times; (yarn over) 3 times, insert hook in next indicated st and draw up a loop, (yarn over and draw through 2 loops on hook) 3 times; yarn over and draw through all loops on hook. This is a beautiful afghan. I am not a big fan of the colors selected but I just love the motif used to create this magnolia. I am not really sure what color would make this stand out more but I just feel like something is missing. I feel making more motifs could easily make this appropriate to fit any size bed. I love the beautiful and earthy feel this Magnolia afghan has! It will be an appropriate reminder of the Magnolia in my front yard! It is great that you included the diagrams as well. This one is just begging to be made. There are sooo many beautiful colors of this yarn you can individualize it till your heart is content. That is if you can choose just one color! This exquisite afghan reminds me of some antique lace bedspreads Ive seen in museums. You could work the afghan is directed, or just work up the magnolia portion and either sew it over a section of a blanket as a large trim, or use it as an inlay between fabric sections. Whatever you decide to do, be prepared for some major blocking to keep the magnolias in shape. The pattern is available as a free download from Lion Brand as well. Very feminine and very delicate looking afghan from Lion Brand and using a bulky yarn and large hook did not take away from that. This will work up super fast with such a large hook. Its the perfect size for using as a cover over your bed and for snuggling on the sofa when its cold. I'm having trouble with round 3 and was wondering if anyone could help me or is there a video? Please help I love this and am making it for my mom who is moving out of the country soon so I want it to be a housewarming gift for her new house. 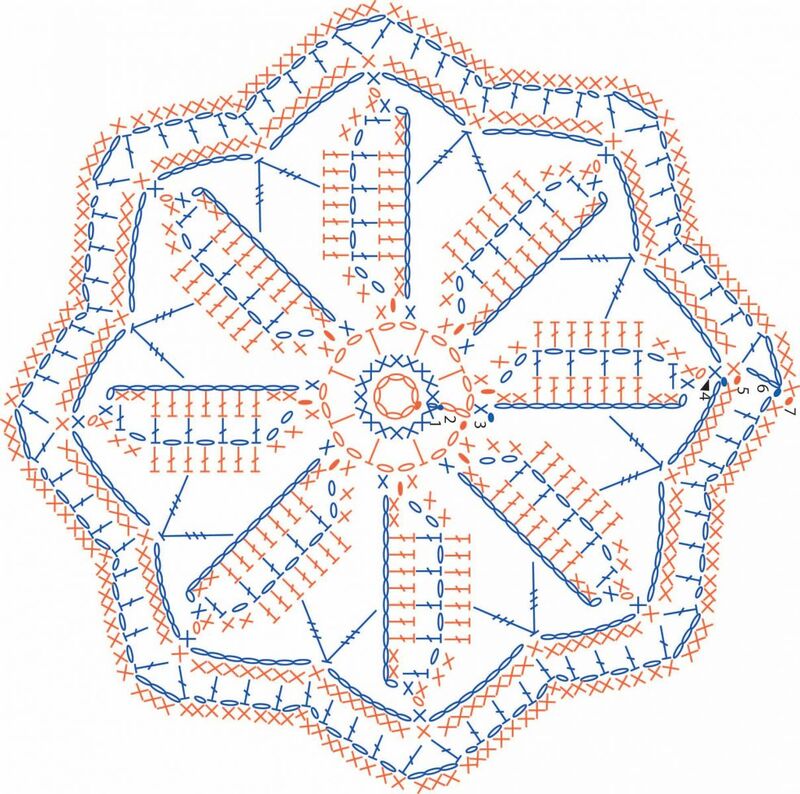 I love this pattern and I'm crocheting it right now but I'm stuck on round 3 and I wasn't wondering if anyone could help? Please I need some guidance. I used Aran yarn instead of the homespun and liked how it turned out. I blocked the magnolias at the same time so they'd be a consistent size. I really love what GrammyGwen did with the pattern and am now trying to do something similar. Thank you for the inspiration GrammyGwen! From afar, this looks like a knitted blanket. This looks elegant by its current color but it will look great in a darker color, probably navy blue or maybe pastel color. It helps that the pattern is right on the front page. Thank you for this pattern, I fell in love with the flower medallions, I made mine different, I added a pic for you to see. What a wonderful job! Love the colors you used on your project too! Was this a difficult pattern to complete? I saw it and thought this would be perfect in all gray to go with my bedding in the master bedroom. Any tips or hints on how to complete this project smoothly without having to start over!? This looks beautiful. But I won't do it in Homespun, as that yarn is so difficult to crochet. This is on my To-Do list. I am pretty much self taught and have a huge problem following the written pattern. Is there by chance a video teaching how to make this Afghan. I would love to make it. jubeg, I've not been crocheting for long, but this pattern looks fairly easy to modify. The pattern says each medallion is 15x15, so each extra medallion will add about that much to the width. If you add one, the blanket will be 75", or two extra medallions will make it about 90" across. For each extra medallion, you'll need two extra side triangles. You won't need any extra corner triangles because those just go in the four corners. For the narrow side panel, the pattern actually says to just keep crocheting rows until the side panel is as long as the medallions that are stitched together. For the wide side panel, you crochet that directly to the medallion strip, so no measuring required. The only thing is I don't know how many extra skeins of yarn that would take. :) This pattern is going in my must-do pile and I'm with you, I really want to make it full size, not just throw size. Forgot to add: You'll need to adjust the width of the narrow and wide panels depending on how many extra medallions you add. Full size blankets are usually about 80"x90", so you'll need to add enough rows to the wide and narrow panels to add another 32" or so to the length if you add two extra medallions.